Etta Baker was one of the most important and revered musicians of all time that created music in the Piedmont Blues style. For those unknown, the Piedmont blues is a finger-picking blues style that typically alternates bass strings plucked by the thumb that supports the melody on the rest of the strings. The effect is much more in line with the white string bands of the Appalachian region than with Delta Blues. The very fact that Etta Baker is so important an influential (she taught the style to Taj Mahal and Bob Dylan just to name two), is perhaps most remarkable because of the 35-year gap between her first recording in 1956, and this recording of 20 songs that came out in 1991. The album is primarily focused on traditional and public domain blues songs and rags, and it heavily leans on instrumental numbers. However, Etta does sing on a few tracks and the aging in her voice lends something special to these songs. 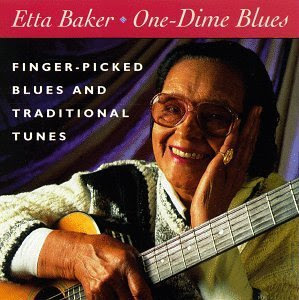 You can listen to much of this album and think it is someone like a Jack Rose or John Fahey or many of the other famous ragtime guitarists that we think of, but something about the way that Etta plays just makes it connect on a whole level. It's really really beautiful and well...American. I meant to post this on February 7th, when I uploaded it but I waited. It's great and everyone should download it.